NASA is funding 5 years Go North Expedition into the northern Arctic . The team will be starting on March 15 from the Alaska .to study out how much snow blankets the earth. 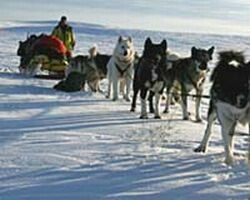 Armed with two dogsled teams consisting of 12-13 huskies it seeks to study out how much snow blankets the earth. Led by Paul Pregont of the University of Minnesota, Minneapolis, it seeks to achieve a better understanding of snow as it is a main supplier of water around the world. These dogsled teams will be gathering data from extremely remote locations to help confirm the satellite observations in Advanced Microwave Scanning Radiometer-EOS (AMSR-E) instrument aboard NASA’s Aqua satellite. So with the certainty of success in mind, once this mission is accomplished our world can boast of the best water management system . And goodbye to scarcity of water. Blame human activities for frequenting hurricanes?